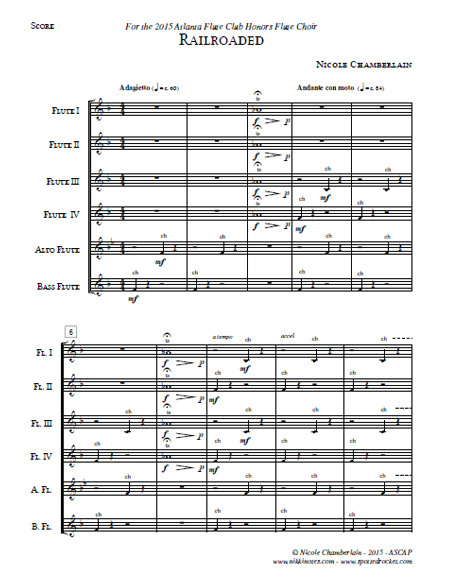 Railroaded was composed for the 2015 Atlanta Flute Club School Honors Flute Choir under the direction of the composer. Atlanta is a hub of sorts for the rail system. No matter how hard the composer tried, she always found herself living within earshot of the railroad since moving to Georgia. It seems that most of the trains do most of their traveling at night blowing their horns as they pass through intersections or returning home. That persistant sound always present in the composers mind. The composer uses some extended techniques such as beat boxing and pitch bending to replicate the familiar sounds of the train on the tracks, blowing its horn.